The cult of celebrity around serial killers is nothing new – take a look at the obsessive fandom surrounding the ‘Clown killer’ John Wayne Gacy, for example, and you will get our drift. Some people are fascinated with the psychology that drives a person to commit multiple murders, and even more so if there is a certain level of gimmickry or calculation associated with the brutality. But with an explosion of images, online videos, constant media coverage, and social media communities on Facebook and Tumblr, fandom for mass murderers in the 21st century has evolved into a new level of bizarre. We encountered a community of people dedicated to James Holmes, the accused perpetrator of a mass killing spree at an Aurora, Colorado premiere of the film The Dark Knight Rises. 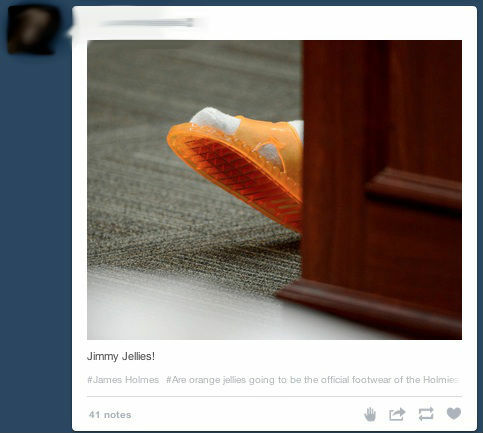 On Tumblr, this community refers to themselves as ‘Holmies’ – and spread memes, tribute photos and messages of support and encouragement for the alleged killer. Even more bizarrely, some members of the community profess to sexual attraction for Holmes, discuss his hairstyle, get tattoos with his name, and devise cocktails named after him. On the surface, it seems pretty weird. 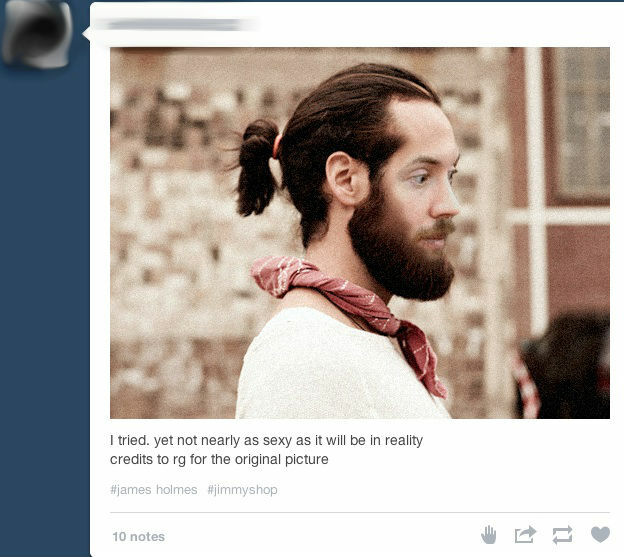 From one Tumblr user who photoshopped Holmes in an attempt to make him ‘sexier’. 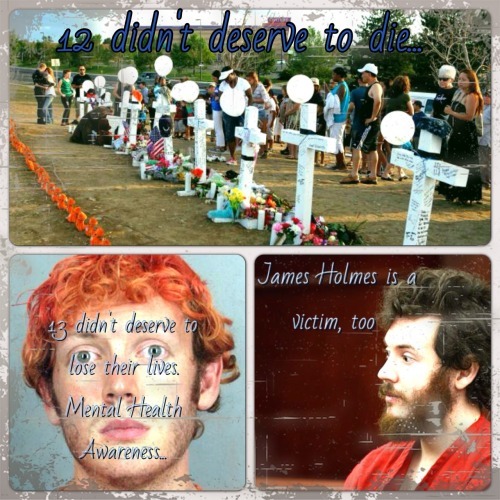 But going deeper, it seems that James Holmes’ questionable mental health lies at the heart of the discussion – the motivation of a significant portion of Holmies is to ask how and why the American Mental Health system failed a sick man in desperate need. “I am emotionally invested in the James Holmes case because one of my own family members became violent in psychosis and tried to take the life of her young child (at the time she had undiagnosed and untreated Schizophrenia). She was then was admitted a state psychiatric hospital for many years. I’m also interested in learning if and exactly how psychosis and violence relate, and how the judicial system handles mentally ill perpetrators – especially in a case of this magnitude. I think it will be very telling about where we stand, as a society, in regards to the mentally ill during this current era in time. But what makes it really strange, is merged with serious discussions at the heart of the issue of mental health, are discussions about his chest hair. 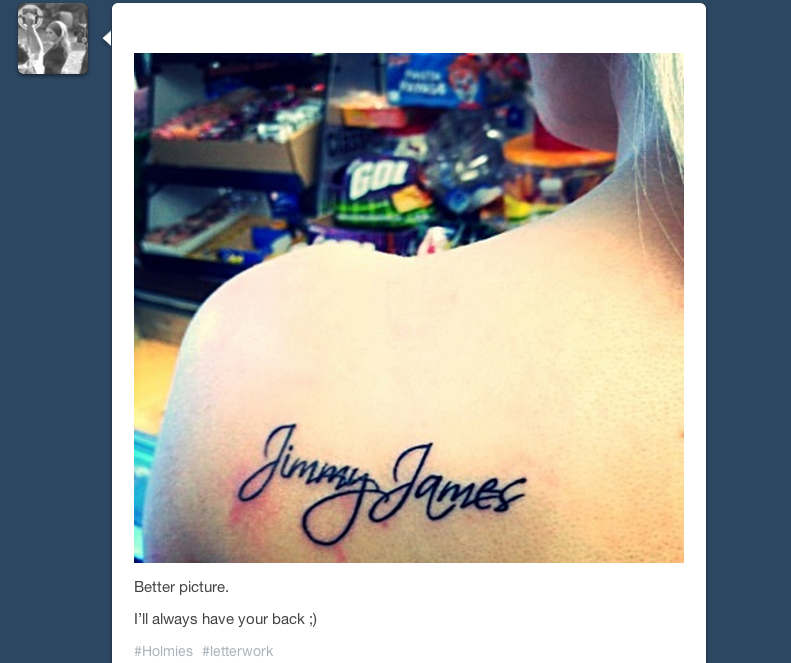 This girl decided to have the name ‘Jimmy James’ tattooed on her back. Jimmy James an the unofficial name that Holmies have given to James Holmes. In our conversations with the Holmies, we got the sense that this was a community who had deep concern for a man who they viewed as a gentle, dough eyed boy who lost his mind, and got entangled in the garbled system of ruined America. It’s almost as if they sometimes forget that this man has been arrested for opening fire on scores of children in a cinema – and sometimes, it seems the gravity of the most gruesome aspects of the case have been absorbed by the obsession. It also makes us wonder what truly drives a person to get passionately and obsessively involved with something like this – some Holmies have been touched by the effects of violence in a failed mental health system and want to speak out about it. But others, it appears, empathise with Holmes on a casual level, and welcome the association that the community provides. Some Holmies had expressed reluctance to come out publicly with their views on James Holmes, but have now embraced their position as a lifestyle, and encourage others to embrace it as well. It reminds us a little bit of a more underground and macabre version of the Kony 2012 campaign – the feeling we get, is that there is as much excitement in the rallying, the sharing of social media, the memes, the animated gifs, as there is in the cause to support him. But something tells us, unlike the severe drop off to the Kony campaign once the cool faded, that the Holmies will be sticking around for a while. Many Holmies seem to be utterly transfixed by the case, pouring over the details, updating reports as they come to light, and sharing absolutely every aspect of the trial across every avenue possible. “It’s more complex then just the mental health issues for some of us. I am one who was unsure from the start if Holmes really was mentally ill or not.” Tumblr user givemesomething2believe writes. Other Holmies unleash fury like savages against anyone who questions their motives – we got a few toungue lashings from a small set over our perceived intentions to sensationalize their involvement with the case. But, The Modern Ritual is not the news media – we want to take the time to understand. However, it does make us think – given that the majority of Holmies are young females – if the ongoing scrutiny of a character like Holmes would be the same if he was not a young, good looking man. A man that, if he weren’t under trial for mass murder, could contextually slot into any of their lives, on a normal day, without a blink of an eye. Some of the Holmies clearly have a desire for him – it really does make us think that if it was a 67-year-old bus driver named James Holmes who went crazy and killed people, would we see the same situation? We are told that the original ‘teeny bopper’ set of Holmies, that cropped up after the initial attack. have since disappeared, but there still appears to be a distinct expression of juvenility in regard to the case. This, some Holmies say, is due to an apparent fatigue over daily concern for the man. The memes, intricate pop discussions, the photoshops, the swooning, we are told, are a form of gallows humour shared by a tight knit group who are feverishly committed to believing in ‘Jimmy James’ at all costs. Although some of the Holmies denied this, I got a real flavour of the common teen practice of flirting with danger – the Holmies know that supporting an alleged mass killer is taboo – and a feeling that breaking these taboos was silently relished by the community. This silence, enveloped only in the semi-secret club of the #holmie Tumblr index, was deafening. From our view, it’s an extraordinarily complicated dynamic to understand with accuracy. The Holmies tell us it’s simple to see – but then we aren’t operating from the same place as them, and we probably never will. The empathy for Holmes appears to be as much cultural as it is human – there appears to be a sense of ‘he is one of us, and we must protect him’. There is a distinct combination of concern for an individual and a curious community who have decided to make an alleged mass killer their posterboy. 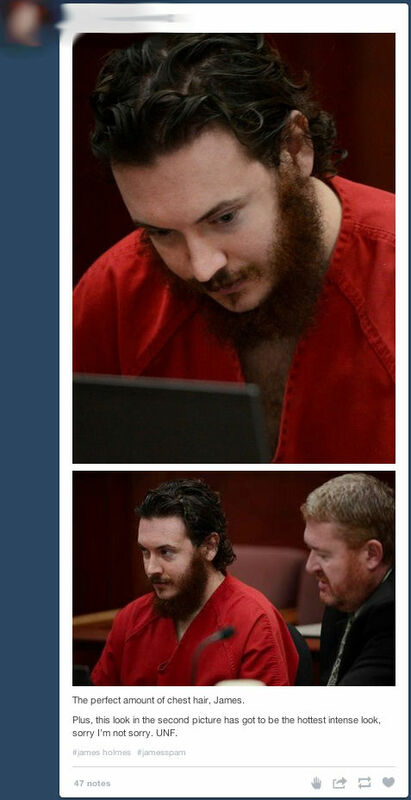 And, in many ways, for a community that wishes to reflect on the dangers of cracks in society that allow people like James Holmes to slip down, he isn’t the ‘hero’ they deserve, he is simply the face of a horrible tragedy.